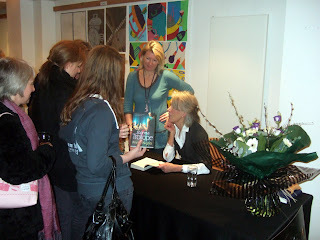 On Tuesday Night we welcomed Joanna Trollope to Abingdon, to talk about her latest book Friday Nights. 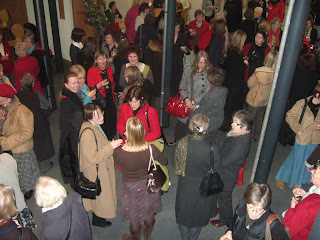 The event was held at St Helen & St Katharine, in their magnificent Yolanda Patterson Hall. We had an audience of over 200 (which we were delighted with, particularly considering it was a chilly Tuesday evening in January). The event was run jointly with the school, and it was also the first event organised with the Mostly Booklovers. They turned out in force to support the event, helping to run all aspects from checking tickets to opening bottles of wine. We couldn't have run this event on this scale as successfully without their help - and this is certainly the way we would like to run big events in the future. 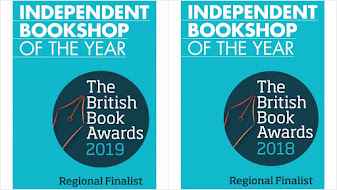 The venue itself has a wonderful 'atrium' area when you first come in, and with the assistance of the Booklovers we'd set up drinks and the bookstall. Many people had come in groups, or met up with old friends - and the atmosphere pre-performance was extremely lively. 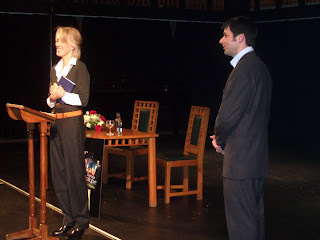 Once we had managed to usher everyone into the Hall, Joanna came out onto the stage to talk about her writing in general, her latest book Friday Nights, and to answer questions from the audience. She was on sparkling form, putting her previous experience as a schoolteacher to very good use by addressing the packed auditorium without a microphone. After taking questions, we whisked her to a signing table at the side of the hall, where she was able to sign copies of her books, and chat to those queuing up to get a book signed. There was the obligatory end-of-evening photo with the author. 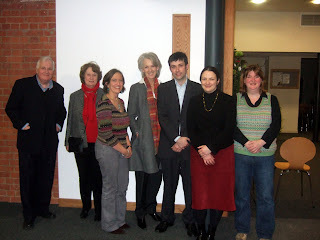 Here (from left to right) are Booklovers Ian & Jean, Nicki, Joanna, myself, Donna (librarian of St Helen & St Katharine) and Annabel (another Mostly Booklover who has also blogged the event here). Thanks to everyone who came on Tuesday, and a special thank you must go to those Mostly Booklovers who have set the bar reasonably high on their first event. But of course, we must give a very big and warm thank you to Joanna and her agent Nicky for trekking out to Abingdon in January, and for contributing to a very special evening. Nice blog. I used to work in Abingdon (before they closed down the MG factory). 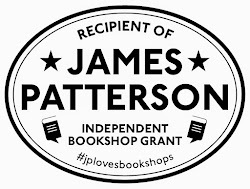 Good to see an indie bookshop doing well.